9 p.m. (EST): The final press conference of the day with Massachusetts Governor Deval Patrick, Boston Police Commissioner Ed Davis and various other officials just concluded. The FBI is now leading investigations of the events. Davis confirmed that three people were killed in today's blasts. CNN is reporting that one of the victims killed was an 8-year-old boy. The Wall Street Journal had reported that as many as five other unexploded devices were found around Boston, but investigators now doubt that they were actually bombs. 6:15 p.m.: One earlier report had suggested that 12 people had been killed in today's explosions at the Boston Marathon, but we do not yet have an official number. Most reports put the number of dead at two, with the number of injured ranging from 69 (according to area hospitals) to more than 100 (Boston Globe). We still do not know who did this or why ... but make no mistake: We will get to the bottom of [this]. We will find out who did this. We will find out why they did this. ... Any responsible groups will feel the full weight of justice. 5:40 p.m.: Boston police have denied earlier reports from The New York Post (see below) that a suspect was in custody. "At this time, we haven't been notified of any arrests or anyone apprehended," said a spokesperson. "Honestly, I don't know where they're getting their information from, but it didn't come from us." 5:30 p.m.: The New York Times published an overhead map showing the exact locations of the two explosions, which were about 550 feet from each other and occurred about 20 seconds apart. If you are looking for a person in Boston or would like to report information you have about someone in Boston, Google has set up a Person Finder. 4:55 p.m.: At a press conference that just concluded, Boston Police Commissioner Ed Davis said that a third explosion, this one at the JFK Library a few miles away from the marathon site, was related to the explosions on Boylston Street. However, the JFK Library is saying that any connection to the first two explosions is "pure speculation," that everyone is fine and the fire is contained. 4:40 p.m.: The New York Post is reporting that Boston police are guarding a suspect in the hospital, as well as a rise in the death toll to 12 and the injury toll to 50.
confirmed that the explosions were in fact bombs, though everyone is still unclear on exactly what happened. We do not know who set them off. 4 p.m.: Multiple sources are now reporting that three people were killed by the blasts. The Boston Police Department has confirmed two of those deaths, as well as 23 injuries. 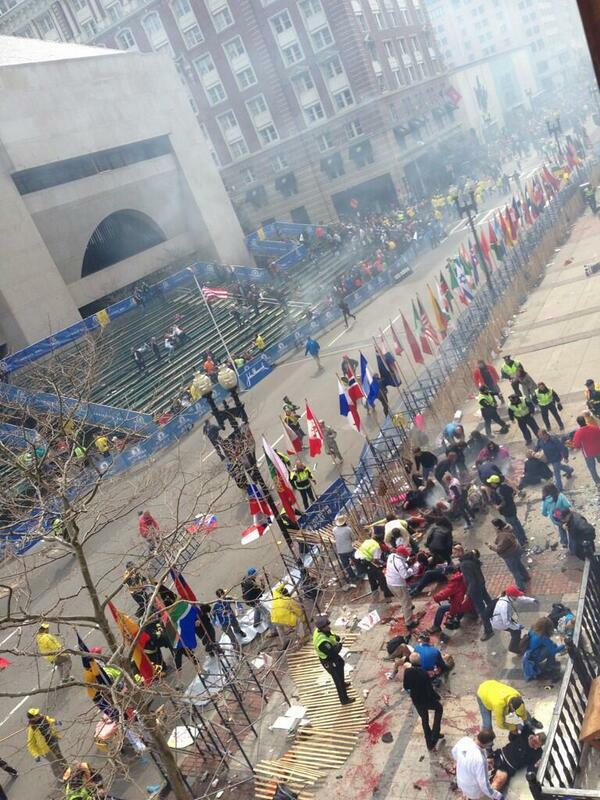 Shortly before 3 p.m. on Monday, two explosions occurred near the finish line of the Boston Marathon. Windows and storefronts were blown out, and there are reports of dozens of injuries. The two explosions happened moments apart, according to witnesses. The annual race is one of the most popular marathons in the country, drawing thousands of attendees, many of whom gather at the finish line. Live video from the scene can be found here.